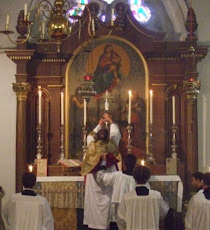 Fr Hunwicke's Mutual Enrichment: "They have uncrowned Him" (2) False Religions? I had a Latin teacher whose method was to give the strap to any pupil who got less than a certain mark for his homework. As I was a frequent recipient of that treatment you can imagine that understanding Latin is not one of my strengths. Could you please provide a translation for any statement which is given in Latin? In my evangelical youth we used to quote the Tash chapter to speakers at S.U conferences.They did not like it at all and we were seen as somewhat unsound. The citation appears to be from Unitatis redintegratio n. 3, not n. 4. The translation on the Vatican website is "All of these, which come from Christ and lead back to Christ, belong by right to the one Church of Christ." I'm not quite sure what is intended by Archbishop Lefebvre's statement, 'But none of these values belongs in its own right to these false religions'. Is he saying that for any system of religious ideas which is not the Catholic Faith, the only ideas that can belong 'in their own right' to non-Catholic sets of religious ideas, are the false ones? Actually, I would suggest that generally speaking, nothing really belongs 'in its own right' to sets of ideas at all. An exception - it makes sense to say, in conformity with 'Unitatis Redintegratio', that all elements of saving truth and grace belong by right to the one Church of Christ - they all derive from Christ, and truly belong to him. But if we're talking about non-Catholic sets of ideas, does any given idea, true or false, belong 'by right' or 'in its own right' to those sets of ideas? I don't know what the content of such an assertion would really be. Speaking in this way seems to be a way of redefining Islam, or Buddhism, or Platonism, or Aristotelianism, or whatever, so that they are only really constituted by whatever is false in them - in which case, obviously and by definition, they are not worthy of respect. But the adherents of each would not recognise the truncated system of thought that resulted as properly representing their own beliefs. Indeed, precisely because, and to the extent that, other religions truly contain elements that belong 'by right' to the one Church of Christ, those religions are worthy of a certain respect: they reflect Christ. "Is he saying that for any system of religious ideas which is not the Catholic Faith, the only ideas that can belong 'in their own right' to non-Catholic sets of religious ideas, are the false ones?" If Anglicans believe the Resurrection (as SOME still do, despite the Dean of Inge and all that), they share a Catholic doctrine, and are not enjoying a specifically Anglican one. This way Catholics treat other religions is reminiscent of how Evangelicals treat Catholicism, they think "Popery" is just things like Purgatory, Mariolatry, Selling indulgences for future sins (!!!!) and things they don't share. But they acknowledge there is "some Christianity" (some true religion, not "belonging to Popery in and of itself") left within Catholic ranks ... however, unlike Catholics, they don't have unbroken apostolic succession to back this up. A certain idea of "Baptist Continuity" has the most flimsy support in historical sources. I suggest there is a notable difference between a doctrine 'belonging in its own right' to the Catholic religion, and a doctrine being 'specific' to some religion. If it is 'specific' to a religion, that means that no other religion holds it. Thus the doctrines of papal supremacy and infallibility are specific to the Catholic Faith. The belief that Muhammad is God's supreme prophet is specific to Islam. The doctrine of e.g. Christ's divinity, on the other hand, does 'belong in its own right' to the Catholic Faith, (deriving as it does from Christ's teaching, and directly entrusted by him as a gift to his One Catholic Church). Now (at least at first sight) it is not, however, 'specific' to Catholicism, since various non-Catholic religious bodies also profess Christ's divinity. The error maybe comes partly from the temptation (of a Platonic bent?) to reduce the essence of something to its specific difference (i.e. that which makes it different from everything else). Thus the essence of man would be reduced to rationality, and would exclude animality. The essence of Islam would include the belief that Muhammad is the supreme prophet (which no one else believes in), but would exclude the belief in the unity of the divine essence (belief in which is shared by others). (And the essence of Catholicism might be imagined as reduced to the papacy (in which no one else believes in the same way), and to exclude the Trinity (belief in which is shared by many) - though here it might be replied as suggested above, that insofar as the others shared the Catholic belief in the Trinity, they were in a way 'Catholic' to a degree). I appreciate Fr Hunwicke's main point that the 'good points' in other religions have often been overemphasised, to the detriment of evangelisation. But I think we have to get the principles accurate, and not overstate the case. One cannot say doctrine x is Catholic, therefore it is not believed by Lutherans. One can say doctrine x is Catholic and is therefore not a Lutheran error or heresy. Your distinction is of course very clear and correct. What His Excellency refers to is nothing else than the Council said on behalf of the non-Christian or non-Catholic religions. There are "elements of truth" in every religion, and in a very high degree in Christian heresies. That is because 1) there is the concept of natural theology: God can be found by the means of the human reason, as well as certain truths; every human, no matter his religion, is able to find God. The old philosophers are a great example when they speak about the ultimate Good, which is the one and supreme god (although they of course did not know the specifics of the Christian faith). 2) When the entirety of truth is given to the holy Catholic religion, and other Christian heresies share some of those fundamental truths, these truths do not become false; they remain true. But the problem is that their teachings are mixed with heresy and error. If a muslim, e. g., believes in the Most Holy Trinity, he believes a fundamental truth, but he still isn't Catholic. The truth he knows is not absolute, but only participatory in regard to the entirety of truth in the holy Catholic religion. A muslim who worships Allah, shares in the fundamental truth that there is only one true God. He names him Allah and denies the Trinity, but monotheism is true. Only because he doesn't know that Allah is actually 3 divine persons, doesn't make his monotheism false. He worships what he doesn't understand. It is like St. Paul when he found the altar dedicated to the unknown God. Mihi valde placet, pater. And the Lewis passage sounds very much like George Macdonald's Unspoken Sermons. Ooh, ooh! Can we talk about "the spoils of the Egyptians"? This hits me hard today, though, because I just found out that the tomb of our new American beatus, Bl. Solanus Casey, resides in a rather junk-polluted place. His devotees seem to emulate him by not complaining and just ignoring this stuff, so I've never seen pictures of it before. But yeah, there's a big ceramic pillar out in the garden with big quotes from the Quran, and inside the tomb building there are statues of political figures and Servants of God who shouldn't have statues yet, and apparently a hodgepodge of other stuff from other religions. Meanwhile, Bl. Solanus just chugs right along, being holy in spite of the efforts of the misguided. But dang, some people! It can not be denied that there has been an increasing number of examples of practical Indifferentism, from the Bishop of Rome, to virtually all Bishops and Priests, to the point where now if one is not a Catholic, no biggie - they will go to Heaven anyways because all people are good, it is claimed because Ecumenism. Pope Pius IX in our times, many of the enemies of the Catholic Faith direct their efforts towards placing every monstrous opinion on the same level with the doctrine of Christ, or confounding it therewith; and so they try more and more to propagate that impious system of the indifference of religions. But quite recently--we shudder to say--certain men have not hesitated to slander us by saying that we share in their folly, favor that most wicked system, and think so benevolently of every class of mankind as to suppose that not only the sons of the Church, but that the rest also, however alienated from Catholic unity they may remain, are alike in the way of salvation, and may arrive at everlasting life. We are at a loss, from horror, to find words to express our detestation of this new and atrocious injustice that is done us. We love, indeed, all mankind with the inmost affection of our heart, yet not otherwise than in the love of God and our Lord Jesus Christ, Who came to seek and to save that which had perished, Who died for all, Who wills all men to be saved, and to come to the knowledge of the truth; Who, therefore, sent His disciples into the whole world to preach the Gospel to every creature, proclaiming that those who should believe and be baptized should be saved, but that those who should not believe should be condemned. The Lefèbvre quote: "even preserve some remainders of the primitive revelation (God, the fall, a salvation)"